Sometimes you read a story that you enjoyed so much and which makes you think that you just need to write about it. 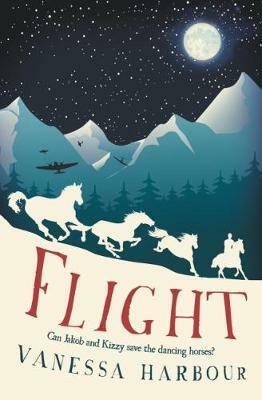 Last week that book was Flight by Vanessa Harbour. A thrilling epic journey which is both heartwarming and at times heart-wrenching. I am a big fan of middle grade fiction with a journey narrative and of accessible historical fiction, and this does both brilliantly. It is a well paced exciting journey, with the strong sense of the threatening presence of the Nazi’s adding to the risks and excitement and there are lots of horses! It is a about a Jewish boy called Jakob who when he is orphaned takes shelter in a nearby stables. His guardian takes him on to look after the Lipizzanner stallions. They are very famous horses owned by the Spanish Riding school of Vienna, who are renowned for their almost dance like dressage performances. When the horses become endangered Jakob and his guardian and a Roma girl called Kizzy set off on an epic journey across the countryside and over the mountains to safety. I loved this story just as much as ‘Sky Chaser’ by Emma Carroll. Flight by debut author Vanessa Harbour is every bit it’s equal. Each cut’s across genre, creating modern historical adventures that will appeal to readers of all ages. This book also reminded me of ‘Running on the Roof of the World’ by Jess Butterworth, where Tash makes an epic journey with two Yaks across the Himalyas. Both stories bring a real strength to the journey narrative in that the main characters have to care for themselves and their animals. Early on you learn the power that the Nazi’s have when Jakobs favourite horse is shot. There is more to come, and because of this I would recommend Flight for children aged 9/10 years and older. However, having said that the constant presence of the Nazi’s is effectively integrated into the story in a way that you feel like you are really there At the same time the full impact is ‘softened’ a little for the reader, as is often the case in the very best of middle grade fiction. The first two thirds of this story is fast paced with plenty of action to keep you reading as you want to find out what happens next. Then the excitement of the journey appears to be over and you are briefly left wondering what will happen in the rest of the story. Less experienced readers and/or children who prefer fast paced stories may need a little encouragement to get past this. The last one third of the story doesn’t disappoint. It is very clever. You get a hint of what life might be like for Jakob and Kizzy after their adventure and for horse fans there is an absolute treat to come! Set within an exciting adventure with horses, is a running theme of prejudice, which is superbly handled by the author and leaves plenty to discuss. This includes: attitudes towards Jews in World War Two, and towards Roma children both then and now, and attitudes to women in sport at this time. I really enjoyed reading this book and can’t wait to see what Vanessa Harbour writes next.